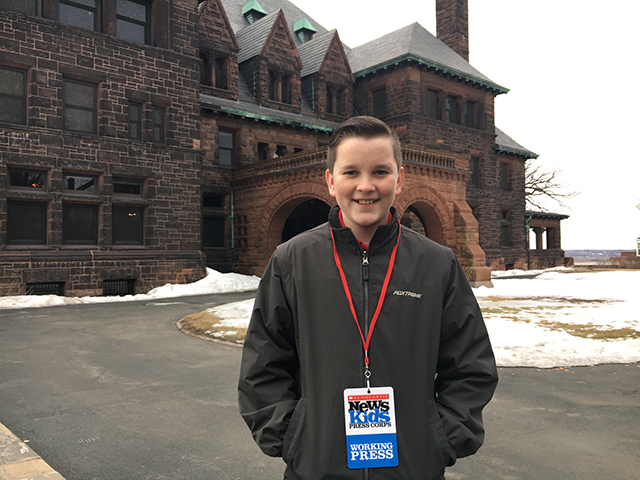 A Dramatic Setting For Shakespeare’s “Hamlet” | Kid Reporters' Notebook | Scholastic Inc.
Click below to learn more about Ryan’s visit to the James J. Hill House for a production of Hamlet. Theater audiences usually rise to their feet only during intermission or when the curtain comes down. For a unique production of Shakespeare’s Hamlet, getting up and moving around is required if you want to catch all of the action. The production is staged in the James J. Hill House in St. Paul, Minnesota. The action takes place in several rooms on several levels of the 36,000-square-foot mansion. This is not the first time that the Wayward Theatre Company has utilized a unique space to stage a theatrical production. Co-founder and director Sarah Nargang said that the group prefers to perform in untraditional spaces. In addition to the James J. Hill House, the troupe has performed at the Minnesota Transportation Museum, in hotel rooms, and in the back of a brewery. The James J. Hill House was built for a railroad tycoon of the same name. The five-story structure sits on three acres overlooking the city of St. Paul and the Mississippi River. Completed in 1891, in what was known as the Gilded Age, it is now owned by the Minnesota Historical Society. "The James J. Hill House allowed us to stage Hamlet during the Gilded Age and showcase much of the opulence of that time,” Nargang said. During the Gilded Age, Hill and other business leaders amassed great fortunes, while many people lived in poverty. Performing Hamlet in a mansion that is almost like another character affected the way the production was choreographed. “Entering and exiting are more difficult because you don’t have very many options of where you can go,” said Tim McVean, who plays the role of Hamlet, a melancholy prince who seeks revenge for his father’s murder. The language in Shakespeare’s plays can be extremely sophisticated, especially for those taking it in for the first time. The actors in the St. Paul production offered suggestions for getting the most out of Shakespeare’s work, which was first performed in the late 16th century in England. The actors said that Shakespeare’s work has endured for centuries because it deftly explores themes that are central to the human experience.